1. 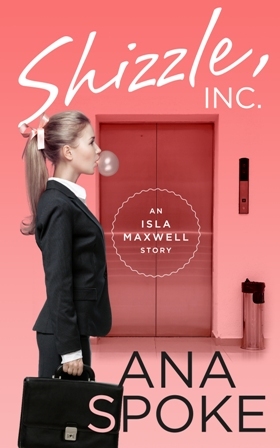 It looks like a “chicklit” cover, which is helpful for potential buyers. 2. It’s simple, with bold lettering. 3. Cute treatment of the “S” in my last name. 1. It’s not funny or original and does not let the reader know that it’s a bizzare comedy. 2. It’s static and the girl has no emotion. None of the adorable innocence and bewildered ignorance of Isa. 3. The lift does not say “corporate offices of a billionaire”. It looks like she’s just going to work in any office. 4. The title and author name are competing in size. 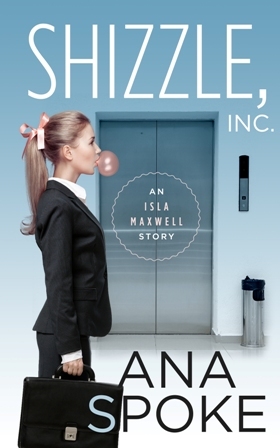 I wanted a juxtaposition of a bubbly girl and a cutthroat corporate world. The torn paper represents the chaos Isa brings to the empire of Shizzle, Inc. Once again, though, it’s my opinion. What do you think? Well, not a gangsta, but in charge. I got my peeps working on the copy edit and cover, you dig? Got myself a project plan and deadlines, targets and KPIs. (Do gangstas have KPIs? Or target revenue?) In any case, I will be published on Kindle in early August, and after a year of waiting by the inbox it feels damn good. I also want to give a shout out to my mama, who didn’t buy the whole electronic thing and insisted that I print at lest one book for her to hold and proudly put on the shelf. Turns out you should listen to yo mama, cause this POD (print on demand) thing is bitchin’! I’ve compared a few major ones, like Lulu and Create a Space, and decided to go with Create a Space for now. Please do your own research, there are plenty of bloggers out there with much better attention span, who have posted proper comparisons. For me, the deciding factor was ease, as Create a Space is the affiliate of Amazon. The good news is, you don’t have to pay anything upfront. Personally, I will splurge on the cover design ($150 upgrade from ebook to paper cover) and probably a professional layout. To be honest, I can’t wait to hold my baby myself. I keep having visions of giggling hysterically on the bed, hugging the first edition to my chest. T-minus couple of months for that dream to come true. Another exciting news is that after two years with Twitter, I have finally discovered Twitter Analytics. Literally, hours of entertainment. For example, it turns out that over the last week I’ve had about a thousand “impressions” per day. (I’ve been very unproductive in my “real” life). That means a thousand people per day have seen my tweets, and the average conversion rate of 11% means just over a hundred people per day clicked on, favourited, or retweeted my Tweets. (Warning: Twitter Analytics is more addictive than Clash of Clans). Damn, it feels good to be in charge…Can’t wait to see what the draft of the cover looks like or what magic the editor does to my final draft. T-minus a couple of weeks! Today is sort of a milestone. I’m giving up on the traditional publishers and going the self-published ebook route instead. Yes, I’m a quitter, I said it. It’s only half-true, though – I’ve decided this a few weeks back, after the latest rejection email. Since then I’ve done quite a bit of research and preparation to produce the best possible work I can. You may or may not be aware just how Russian I am. I hope my “written accent” is not as harsh as my spoken one. Still, I had to come to terms with the fact that maybe, just maybe my prose is not all that “native”. That meant I had to start throwing money at the problem. Not everyone was as thoughtful and managed to fix my errors without losing the protagonist’s “voice”. One editor crossed out the first paragraph alltogether and wrote a new one. Another corrected grammar and word choices to the point that my chicklit novel read like a textbook. The copyedit will be finished by the end of June, by which time I will have a proofreader ready. I plan to get an American editor, since the novel is set somewhere in the southeastern US. Al together the structural edit, the copy edit and the proofread will cost me about $3,500 AUD. Ouch. My next problem are the potential lawsuits I could face from making fun of a host of celebrities. Yeah, I know, the comedians on TV do it all the time, but I want to make sure my gags don’t land me in court. 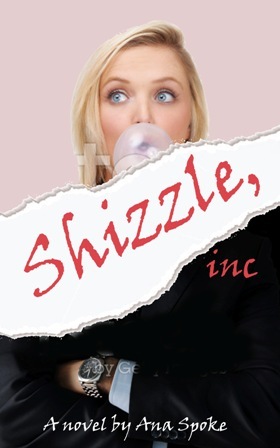 Also, the novel has many “spoofy” moments, making fun of various films, quoting song lyrics, and books. Better safe than sorry. I’m currently seeking advice from Arts Law, an organisation offering advice to artists at a very low fee (just a $150 annual subscription). I will post later on my experiences with Arts Law lawyers. Hope my review wouldn’t land me in court, either. Then there’s the cover art, ISBN number, promotional copy, and a headshot of the happy author…I will be busy for a couple of months. My goal is to have the ebook available on Amazon Kindle by the end of August. Most importantly, I will have a big fat (and very expensive) dot at the end of this project. Hopefully it will let me move on and start writing a sequel. And that, as VISA claims, is priceless.